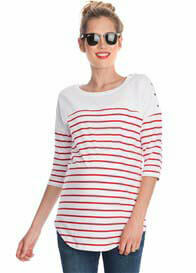 From casual chic to trendy elegance, at Queen Bee, we have short sleeve maternity tops to suit every occasion. Choose from tees, tunics, nursing tops, shirts, blouses, kaftans and kimonos in all the top names including Supermom, Trimester, Esprit, Noppies, Queen mum and Maternal America. There’s a fabulous range of colours and styles to mix and match your maternity wardrobe, so browse and shop with confidence at Queen Bee, the top online boutique for short sleeve maternity tops. After a decade of supplying mums-to-be with fashions that make them feel good about themselves, Queen Bee is now Australia’s leading pregnancy and motherhood online style boutique. We have more than 60 different labels of maternity wear for every occasion and our website is also a go-to destination for maternity health news, wellbeing tips and style and lifestyle ideas. So browse our range today and make your pregnancy a happy and stylish occasion with Queen Bee, voted number one by mums around the world.